If I told you moving overseas with cats is rather easy – would you believe me? Perhaps not at first, right? Truth is, the process of moving cats overseas is intimidating if you don’t know where to start. But it doesn’t have to be! Take our word for it. We have moved overseas with our cat Yoda 4 or 5 times! The process is just a checklist which I’m going to dissect in this article. As you’ll see, moving abroad with your cat is doable and (almost) hassle-free! 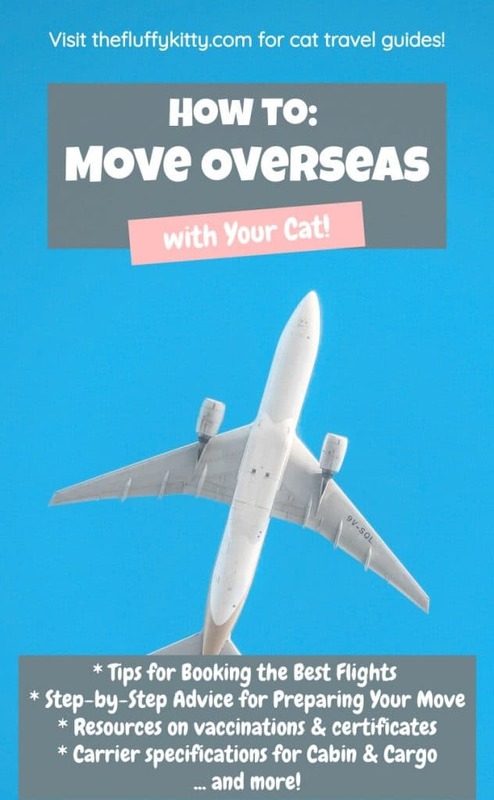 With just one article, you’ll be able to master moving overseas with cats in no time! Getting packed to move abroad is one thing, but getting your cat ready to move abroad is another! 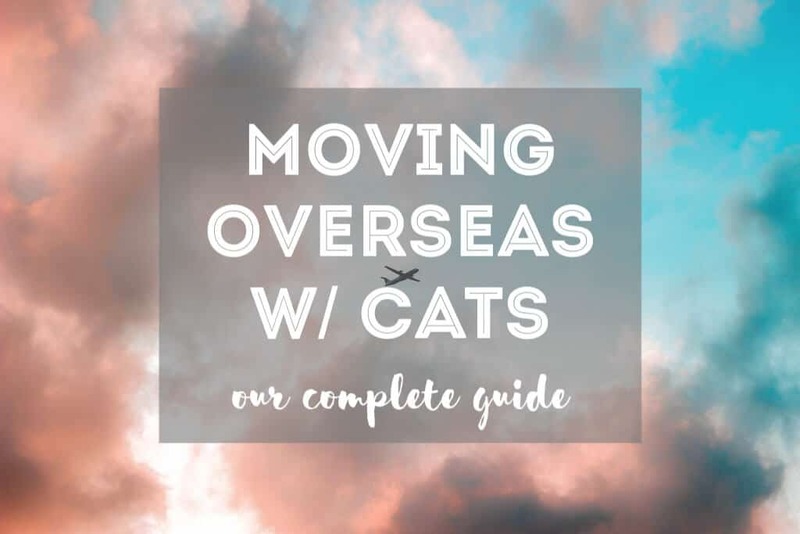 Here is everything you need to start with the process of moving your cat overseas. 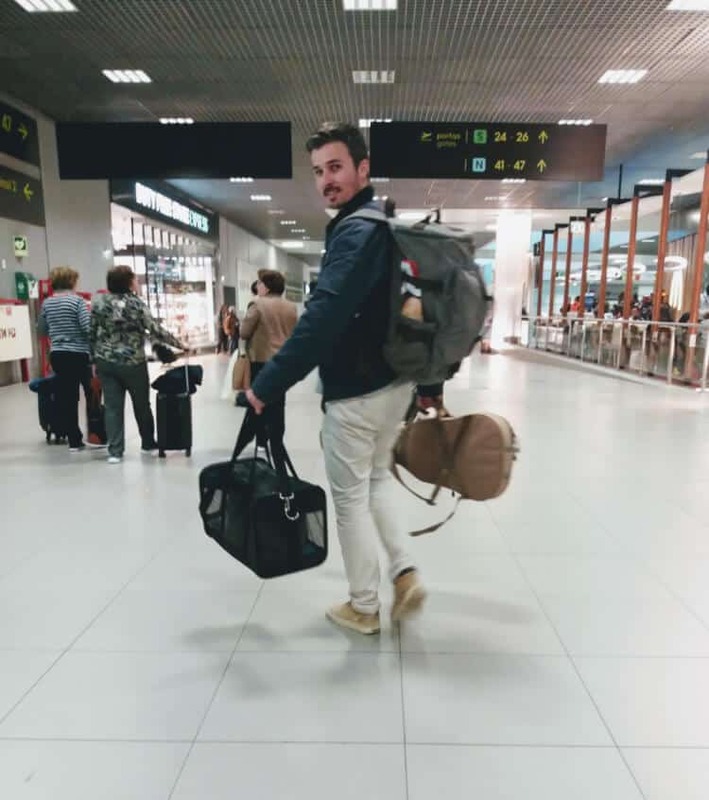 The biggest mistake we see cat and dog owners make when they fly with their pet is this: they spend thousands of dollars on a third-party pet relocator company. Folks, you don’t need any fancy pet service to move your cat or dog overseas. The same airline company you will yourself fly with works just as good and will save you hundreds and hundreds of dollars. The trick is to do a little triage! Narrow down 3 airlines that you could book your own flight with. Then, check the pet policies of those three airlines. Once you research, review, and confirm the information you found regarding those pet policies, choose which one is the best match for your situation. In the article below (see “also read”), I list out 12 popular airlines to fly with pets. Please use this guide to check how much it costs to fly a cat either domestically or overseas. Some airlines have better overseas rates than others. In addition, some airlines allow cats in-cabin on long-haul flights, while others only permit travel in cargo. Moving overseas with cats gets tricky because of different regulations based on country. While some countries make it really easy to import your pet, others have some strict requirements. 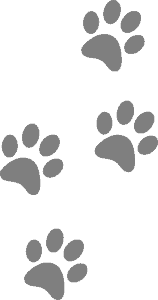 Please use this resource to verify which documents and vaccinations your cat will need for the country you are moving to > APHIS Pet Travel. The requirements for moving your cat overseas to a new country vary by country. Remember, don’t get discouraged at this point! It’s only a checklist, remember? It helps to write down a list of what information you find so you don’t forget it later. Even if you’re unsure, write it down so you can double-check your information with your vet, airline company, or country official. Always, always get the information you have confirmed, just to make sure you cover your bases safely. ⚠️ Please Note: Airlines might require separate documents than the country. 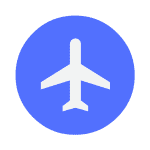 Check with both your airline and the destination country to verify which documents you need. Export and import policies can change frequently, so check back often before your trip. Now you have the essential information, it is wise to set a schedule of everything you must get done so that it’s completed on time. Moving your pet overseas is like a game of dominoes. You can’t finish off the line if one domino missed its target, thus ruining the flow! Schedule your pet’s visit to the vet for vaccinations and the health certificate. You must proactively set a date for your cat’s visit to the vet in order to update all necessary vaccinations. You should also discuss the veterinary health certificate required by most airlines and countries at this time. The veterinary health certificate is a certificate that indicates your cat is fit to fly and is in good health and condition. Because this document must be accurate and relevant to your pet’s condition by the time they reach their destination, the certificate must be issued and signed by a vet AND an official USDA APHIS officer within 10 days of your departure date. Depending on your cat’s current vaccinations, age, and also the destination country’s requirements, certain vaccinations might have a time or age-sensitive requirement. For example, some vaccinations might require that they are administered no earlier than 3 weeks prior to departure date. And if you have an appointment for the vet health certificate within 10 days of leaving, thinking you’ll just have the vet update all vaccinations then – then this can cause a problem. Make sure to consider vaccination times, your pet’s age requirements, and so on, when making your schedule. When it comes to getting the vet health certificate indicating your cat is fit to fly, make sure to go “early” within that 10 day limit, because after the vet gives it to you, signs and stamps it, you must then overnight FedEx it to your nearest USDA APHIS office (your vet will tell you) and pay for return shipping. On a personal note, the staff at the USDA office in Florida have always been extremely speedy with my application. I get a phone call, I pay the fee over the phone, and then they tell me it’s on its way back to me. Sure enough, 1-3 days later, I have the vet health certificate back, now signed by both Yoda’s vet and an official USDA officer. Last step: Make copies just in case and hang on tightly to the original. Personally, the hardest part is everything I listed above because of all the intimidating document stuff that needs signing and so on and so forth. So, congrats! You’re over halfway there. What’s left now is just preparing for your move overseas with your cat in terms of logistics. With the excitement of moving abroad, don’t forget your cat needs a little preparing of their own! First, make sure your cat is comfortable being in the airline-approved pet carrier for long durations. If you found an airline that accepts cats in-cabin overseas, then the logistics just got a whole lot easier. 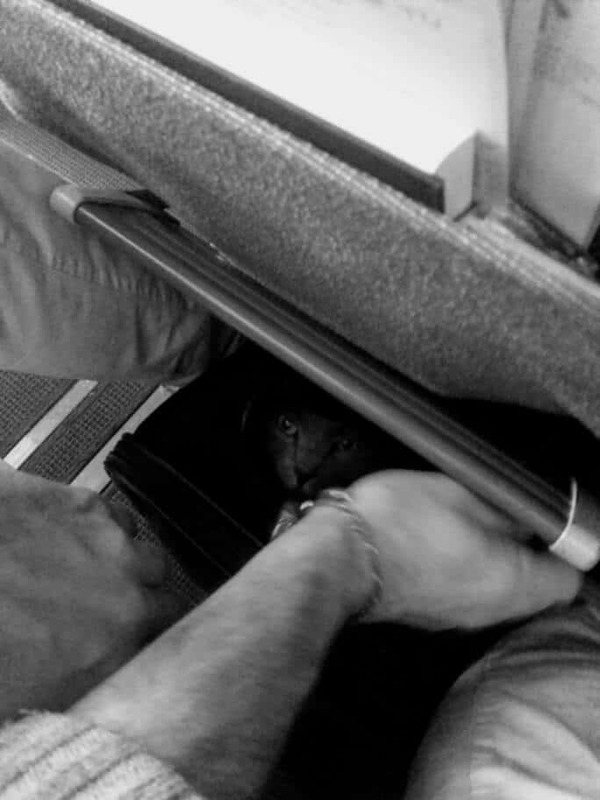 On the other hand, if your cat needs to go in cargo underneath the plane, you’ll need to do a little more prep work. In either case, it’s essential your cat takes to the carry well. For that, make sure to associate rewards with the carrier. 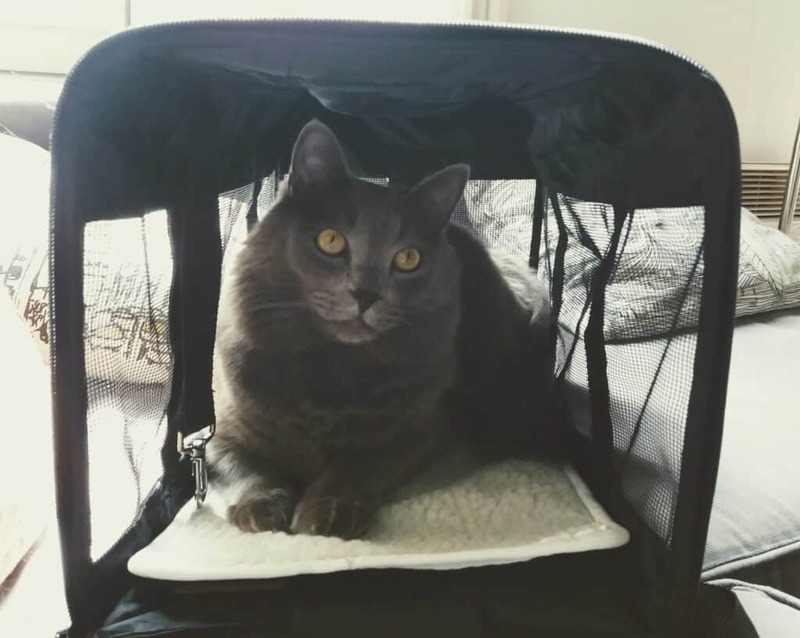 Let it out in the open for the weeks prior to the trip, feed your cat next to it, and go on short rides with your cat in it so they get used to the idea of traveling in a carrier. Whether your cat flies with you in-cabin or below in cargo, there are some requirements for each. Flying your cat in the cabin overseas is like getting bumped to business class! It makes life a whole lot easier, so if you can, make sure to try and find a suitable airline that will fly your pet in-cabin first before immediately thinking about cargo. For in-cabin hauls overseas with your cat, you really only need an appropriate airline-approved carrier lined with a pee mat. Make sure to get soft-sided, or a flexible carrier (not hard), as they fit better under the plane seats. Bring a portable/collapsible bowl for food and water if possible, although this is not required. Make sure to check your aircraft’s seat dimensions. Flying your cat or pet in cargo is not ideal, but it isn’t the end of the world either. While there are awful stories out there, most people who put their pets in cargo have a successful, safe trip. We have put Yoda in cargo 3 times out of necessity (airlines, itineraries). While it may seem like a lot, you already have most of it! All of these items are available online or at your local pet store. So now the weeks (or days) are closing in on the departure date! What is there left to do to move your cat overseas? It is better to be safe than sorry. Being prepared rules out mistakes, which you want to avoid at all costs! Call your airline, confirm your pet’s booking and reservation. Ask any questions about doubts you may have and reconfirm required documents. Make sure to get your vet health certificate signed on time by everyone involved. Make 2-3 copies just in case. Check you have the carrier ready to go, with all required nuts and bolts, pee pad, stickers, bowls, etc. Make sure your cat is comfy inside and has plenty of room and feels secure. Have all your documents, original reports, and receipts in a folder. Keep this with you as you’ll need to show your pet’s documents at check-in and at boarding. Having people stare at you because of your cat can be unsettling for some. I personally don’t mind, unless it bothers Yoda. When you go through security at the airport, you will have to take your cat out of the carrier to hold him or her as you walk under x-rays and get your hands swabbed. If you have a skittish or nervous cat, you can ask for a private screening with a TSA agent. They will take you in a private room and check your cat and swab your hands there. You want to minimize the chances your cat gets sick as much as possible. Therefore, only give your cat little doses of food before the trip. But don’t starve them either. I’d rather Yoda be full and sleepy than hungry and constantly thinking about his next meal! If your cat is with you in the plane cabin, you’ll be able to feed them when they are settled and less stressed. If your cat is in cargo, make sure to add some more food to their bowl before you leave. Cats are special creatures, aren’t they? They can tell when we are happy or sad, and can even support our mental health. Don’t think that your cat can’t pick up on your stress, because they can! The flight will go well, just make sure to convey that to your cat. Give cuddles, positive compliments, and treats. If your cat is unhappy about traveling, it is never a good idea to sedate your cat for travel. Sedation actually increases stress, as your cat will struggle to stay alert despite the drug’s effects. They can have a terrible experience, get nauseous, and despise the memory of plane travel. There are some healthy alternatives, such as soothing aromas that are natural and not harmful to use. Some research is even showing the benefits of natural CBD oil for stressed-out cats. Send us your questions about moving with your cat or pet overseas! This guide is 100% handwritten based upon our experiences flying with our cat overseas on several occasions. If we didn’t cover anything in this article you’d like to know about, please drop us a comment below and we’ll get back to you asap! Moving abroad with your cat is no easy endeavor, but it is very much worth it! As I said earlier, you need patience, hard work, and some effort! Don’t be intimidated by the process and remember it’s just a checklist which you can tick off step by step by step. When you break it down, it gets a lot easier. If this article helped you plan your overseas trip with your cat, please share it with a friend. We help you and you help us! 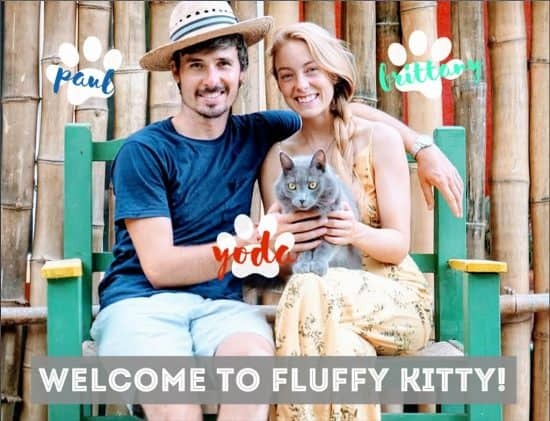 Thanks for being a part of our community here at Fluffy Kitty.